London has its fair share of pop-up beaches each summer, but nothing beats the proper sunshine-ice-cream-fish-and-chips-neon-lights-cheesy-music-arcade-games-donuts-on-the-pier British seaside. 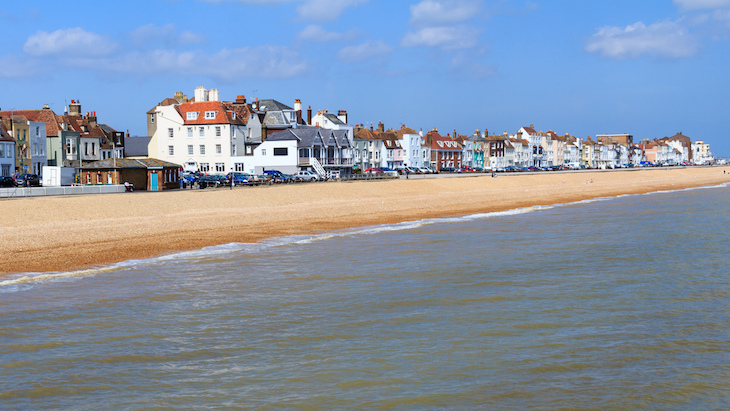 These Kentish seaside towns are all within easy reach of London, whether you're looking for bucket-and-spade sand or something a bit more sophisticated. 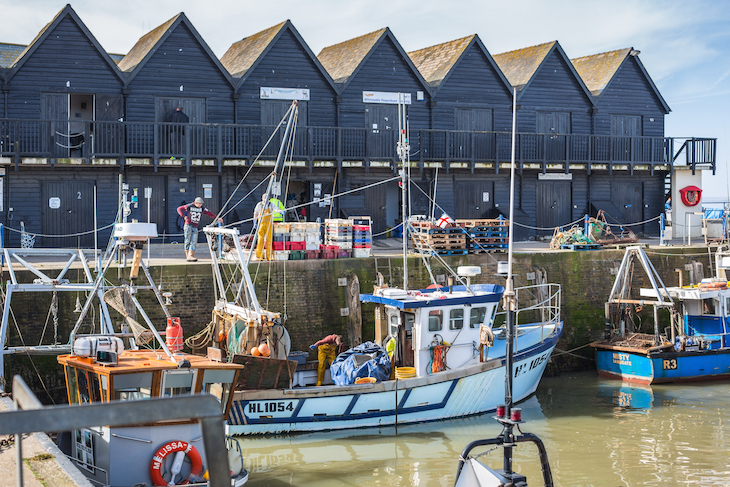 Whitstable's increased in popularity with Londoners in recent years, giving it something of a hip reputation. Its working harbour means oysters are plentiful around these parts, and the oh-so-pink Wheelers Oyster Bar gives it something of a Wes Anderson feel. 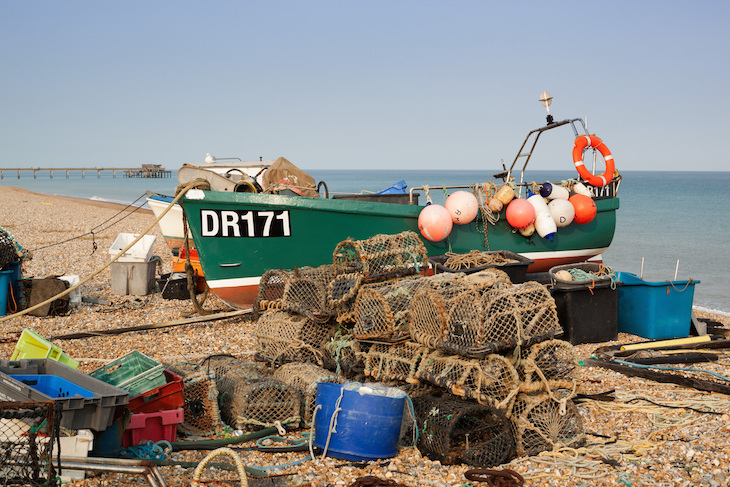 The prevalence of fishing boats and wooden fishing huts alongside the shingle beach, make for a postcard-perfect British seaside experience. Jutting out into the North Sea like the wayward limb of Kent, Margate's come a long way since the head 1982 days of Chas and Dave (and Rodney and Del Boy, seven years later), the 2011 opening of the Turner Contemporary Gallery giving it reason to polish up its act. Of course that sandy beach — one of the best in the south-east — is still there, and packed to the rafters when the weather's half decent, and you'll still get your stick of rock or '99 if that's what you're after. 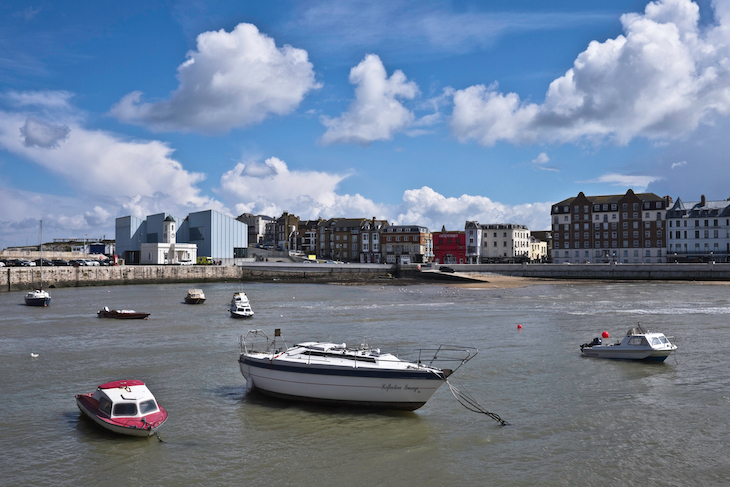 But Margate's got cool, with plenty of vintage shops, kitsch cupcake cafes and art galleries to keep weekend visitors and Instagrammers happy. Attraction-wise, no-one's ever sure if Dreamland's open, it's closed so many time since its massive resurgence in 2011, but there are plenty of other attractions in the town. The Shell Grotto, buried under the streets is a unique and mysterious collection of more than 4 million shells lining 70ft of underground passageways. Vintage furniture shop Junk Deluxe is unique in its own way, drawing collectors from miles around, with plenty for the casual browser too. And of course, the shelter where T S Eliot wrote The Wasteland still peers out over the shore. But don't let that put you off, eh? 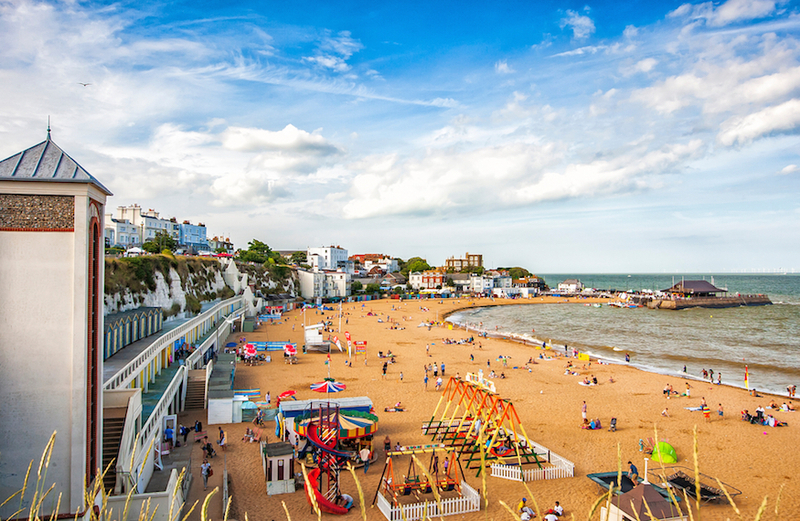 Sandwiched between the better-known towns of Margate and Ramsgate, Broadstairs is often overlooked, but for our money, it's the best of the three. 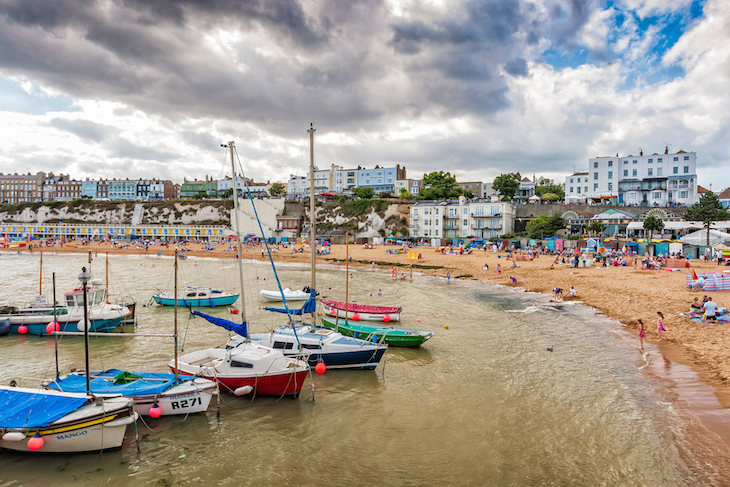 It doesn't tend to get quite as busy as Margate (yet), but its sandy, sheltered beach Viking Bay is one of the best in the south-east. 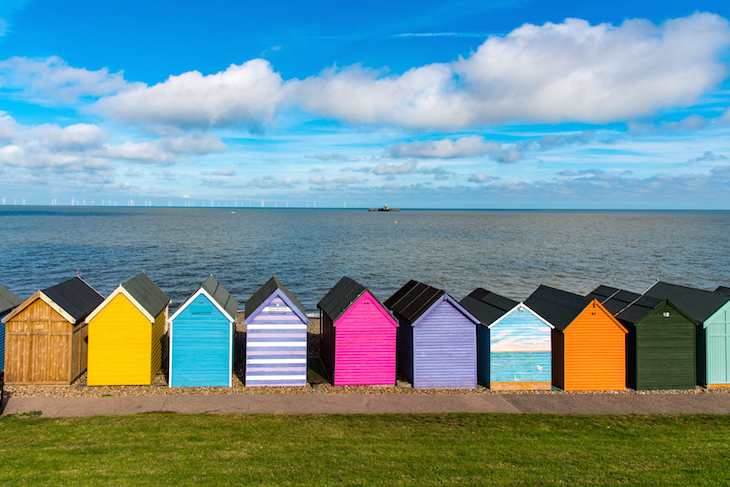 It's also got a beautiful collection of beach huts for anyone seeking that Instagram shot. And some gorgeous houses look down on the beach from the cliffs above. If you can tear yourself away from the golden sands, head to Morelli's Gelato to cool down before exploring the town centre. The Dickens House Museum celebrates the author's links to the area (keep your eyes open for other nods to his work, including Bleak House, an interesting name for a B&B). 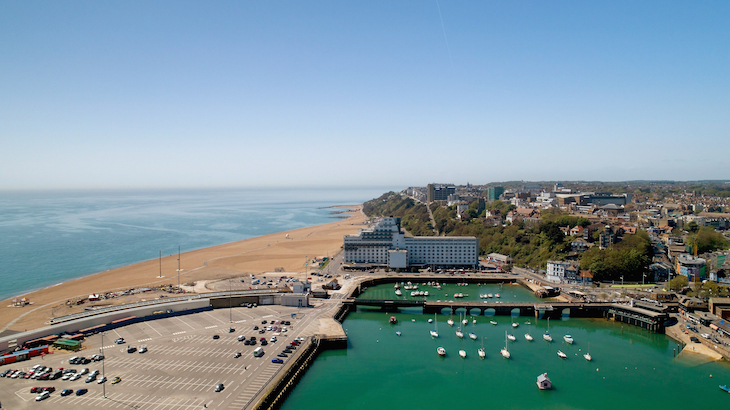 Ramsgate boasts one of the largest marinas on the south coast, so if you're looking for somewhere to dock your yacht (aren't we all? ), head here. There are plenty of bars and restaurants around this part of town too. The harbour is the only one in the UK to be designated as a Royal Harbour, although what that means isn't clear — we've certainly never seen Brenda and co. taking a dip in its chilly waters. If you've not got a yacht, there's still plenty to do around these parts. 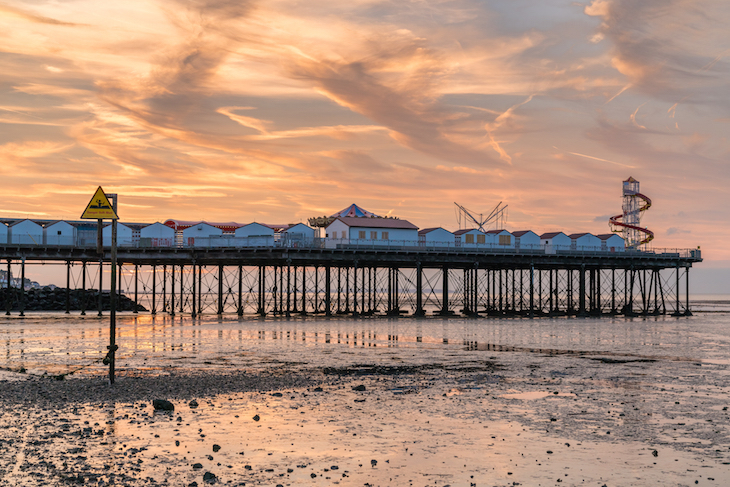 It's something of a typical seaside town, with amusement arcades, a harbour and pier (worth walking to the end if you're into sea views), and ample fish and chip shops. If it's a beach day you're after, head north along the coastline to the East Cliff Promenade and Beach. Otherwise, there's plenty to do in the town centre, including exploring a network of wartime tunnels and the Maritime Museum, which tells some of the area's history, as well as displaying work by local artists, all overlooking the harbour. Deal and Walmer may have started as two separate towns — each with its own castle — but these days, it's hard to tell where one ends and the other begins. While Walmer Castle, which dates from Tudor times, and its gardens, are worth a visit, we recommend heading to Deal for the full seaside experience. At time of writing, Deal Pier is closed for much needed refurbishment (updates here), but the town's pebble beach is still very much open for those looking for a sunbathing spot or a dip in the sea. Beyond that, it's very much your typical seaside town, albeit a smaller, more subtle version. Amusement arcades sit alongside fish and chip shops, pubs and cafes, and ample hotels and B&Bs. Yet rather than screaming their tourist-baiting credentials through neon signs, the quaint buildings are a mish-mash of pastel-hued, wooden boarded beauties. One of the lesser-known entries on this list, these are two separate towns on Romney Marsh, but the mile or so walk between them is easily done on the tarmac seafront promenade. It's a pebble beach, so leave your bucket and spade at home — but from past experience, we'd recommend bringing a kite (or purchasing one at one of the many seaside shops), if you're that way inclined. 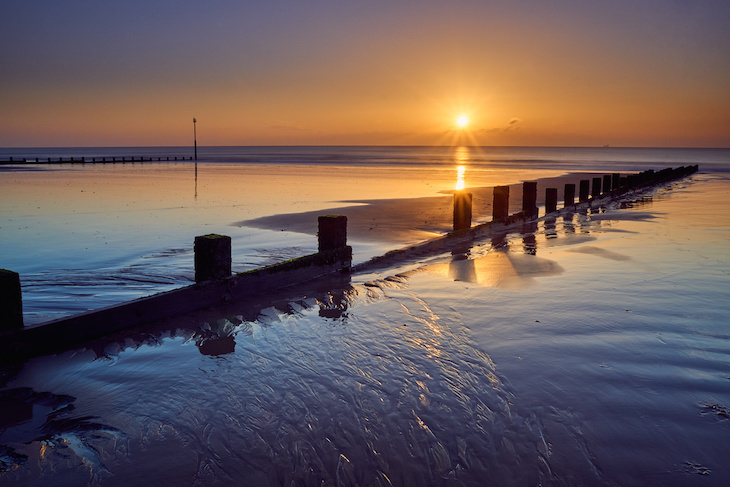 In Dymchurch itself, the amusement park and various bars and cafes and will satisfy any rock/candy floss cravings, with lilos and toys are readily available from a number of shops with stripy awnings. 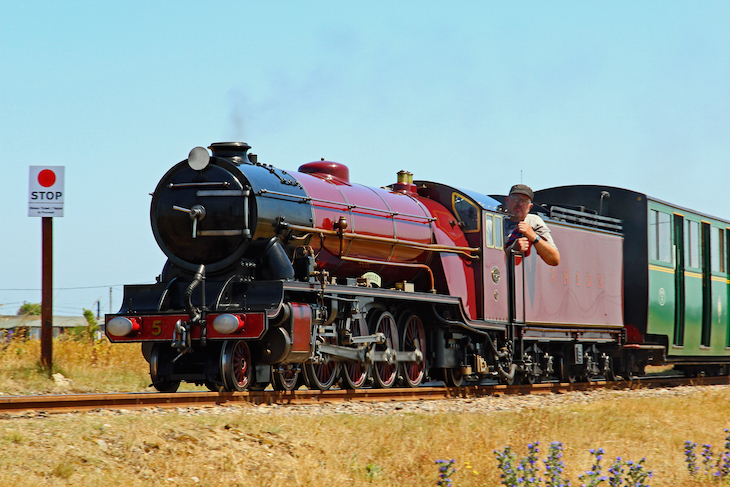 The Romney, Hythe & Dymchurch Railway shuttles steam and diesel locomotives through the area, with seven stations to choose from. For anyone having London withdrawal symptoms, the City of London pub does a cracking Sunday roast. We're not saying it's a looker of a town; groynes pepper the length of the beach, while concrete martello towers are the main landmarks on the shore. Herne Bay literally has a museum called The Seaside Museum, so it was a shoo-in for this list. Once you've finished perusing the current exhibition, take a wander out on the pier and ride the helter skelter, or tuck into seaside snacks. For a more peaceful time, head out on the harbour arm — otherwise known as Neptune's Arms — for views out to sea. The town also has some of the best beach huts in Kent, providing a psychedelic backdrop to that pebble beach. 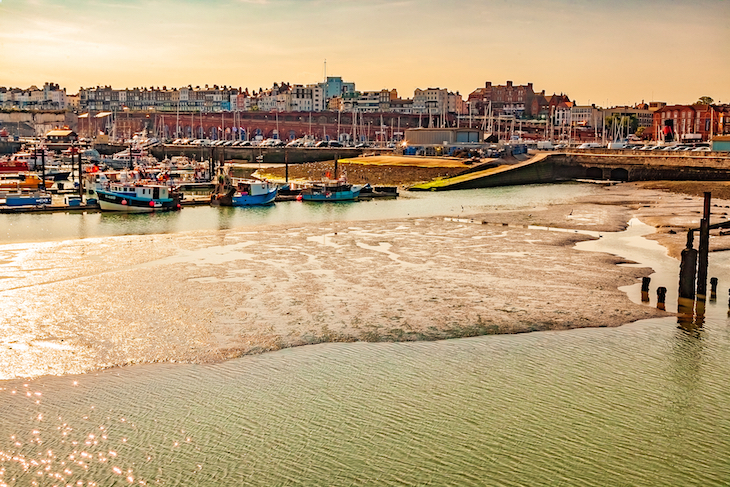 If you want sea air and seafood, Folkestone's the one. The Harbour Arm, a former railway track has been regenerated as a public space in recent years, with plenty of restaurants and bars — and an impressive viewpoint — jutting out into the sea. Regular events take place in the summer, including live music and film screenings. By far the best restaurant in town is Rocksalt, winner of numerous accolades and offering panoramic views over the harbour. You'll want to book in advance to make sure you get a table. 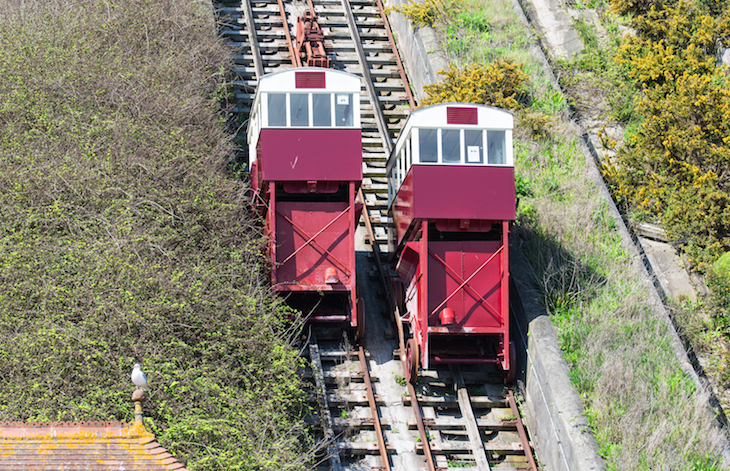 There's an extra treat for transport fans in the form of the Leas Lift, a funicular railway which connects the seafront to the The Leas clifftop promenade. Again, being a port town, Dover isn't a quaint seaside village. There is a stretch of beach on the Esplanade, but given that it's within the Harbour, you'd be better off heading to one of the other places on this list if you want a dip. The town also has its own Tower Hamlets — nothing to do with the London borough, but somewhat reassuring if you're getting London withdrawal symptoms. 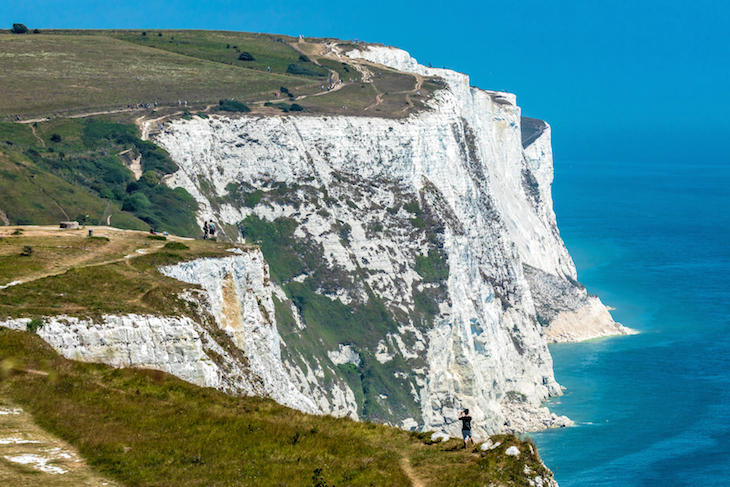 Head a couple of miles along the cliffs to visit South Foreland Lighthouse in the village of St Margaret's Bay. It was the first lighthouse to use an electric light, and is now owned by the National Trust. Where have we missed? Let us know in the comments.